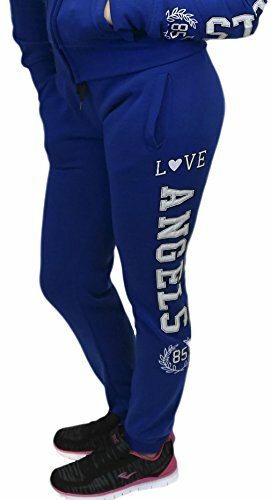 Love Angels 85 Joggers Cotton Blend Sweat Pants Lounge Loungewear with Fleece Lining. Sweatpants come with Wide Elastic Waist with Drawstring, side pockets and ribbed cuffs. Material 55% Cotton 45% Polyester. Available sizes small, medium, large, extra large. Available colors: light grey, burgundy, black, charcoal, red, royal blue. MACHINE WASH SEPERATELY, WARM WATER, TUMBLE DRY LOW, NON CHLORINE BLEACH IF NEEDED DRY LOW HEAT, WARM IRON (NEVER HOT) IF NEEDED. The digital images we display have the most accurate color possible. However, due to differences in computer monitors, we cannot be responsible for variations in color between the actual product and your screen. If you have any questions about this product by Roma Concept, contact us by completing and submitting the form below. If you are looking for a specif part number, please include it with your message.